U.S., South Korea Begin Massive Military Exercises : The Two-Way The annual Vigilant Ace exercise is taking place amid increased tensions with North Korea over its nuclear program and the recent test of an improved, longer-range ICBM. 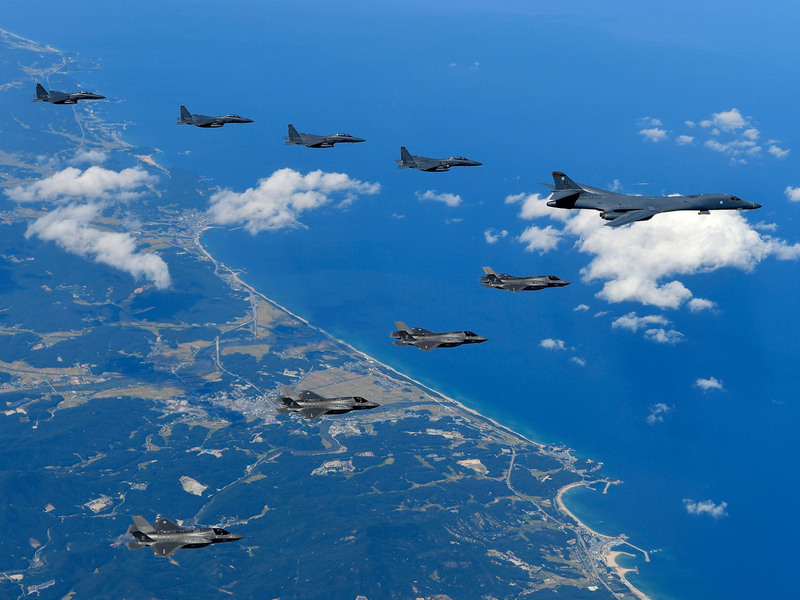 A U.S. Air Force B-1B "Lancer" bomber flying with F-35B fighter jets and South Korean Air Force F-15K fighter jets during a training at the Pilsung Firing Range in South Korea in September. The United States and South Korea launched a massive joint military air exercise on Monday amid increased tensions with North Korea over its nuclear program and recent ballistic missile tests. The five-day Vigilant Ace exercise includes some 12,000 military personnel and 230 aircraft – including six F-22 and 18 F-35s, both with stealth capabilities. South Korean media said B-1 bombers would also participate in the exercise, but the Air Force declined to confirm that. As NPR's Elise Hu reports from Seoul, "These exercises come just a week after North Korea tested what analysts believe is its most powerful missile yet, one that has the capability of reaching much of the continental United States. South Korea's defense ministry says the drills were planned before the missile test. But exercises on the peninsula often draw the ire of North Korea, which views these drills as provocations." Earlier, Pyongyang had said of the exercise, in its third year, would bring the Korean peninsula "to the brink of war." The Military Times writes that the exercise, which runs through Friday "will include enemy infiltration and precision strike drills with South Korean jets across eight military installations." The newspaper quotes an Air Force spokesman who said "the exercise is designed to ensure interoperability between Republic of Korea and U.S. airmen, as well as to build readiness to defend the Republic of Korea from a North Korean attack. It is not, however, a direct response to any North Korean provocation." Last week, North Korea launched a new ICBM known as the Hwasong-15 with an improved range that could in theory allow it to reach the whole of the continental United States. However, some analysts have pointed out that in the event the missile were paired with a nuclear payload, the weight of a warhead would significantly reduce its range. As NPR's Geoff Brumfiel reports: "The North previously conducted two tests of an ICBM called the Hwasong-14 in July. In addition to appearing to be far larger than that missile, the Hwasong-15 also looks like it has more powerful engines, [Markus] Schiller [an aerospace engineer with the German company ST Analytics] says. He also believes the North has learned how to 'gimbal' the thrust chambers on the bottom of the engine — an advanced way to steer the missile that North Korea has never used before." National security adviser H.R. McMaster, speaking in an interview on Fox News Sunday, said it was in the best interest of both China and Russia to help contain Pyongyang, but that the U.S. was prepared to go it alone. "If necessary, the president and the United States will have to take care of it, because he has said he's not going to allow this murderous, rogue regime to threaten the United States with the most destructive weapons on the planet," McMaster said. Some 28,000 U.S. military personnel are stationed in South Korea — many with their spouses and children. As tensions on the peninsula heat up, Sen. Lindsey Graham, R-S.C., is urging that U.S. military dependents be moved out. Graham, speaking on CBS's Face The Nation, says it is "crazy" to have spouses and children potentially in harm's way. "I want [the Pentagon] to stop sending dependents and I think it's now time to start moving American dependents out of South Korea," Graham says.